Basic physics research into the structure of the proton has spawned many beneficial and direct applications, such as magnetic resonance imaging (MRI), proton radiography (which is being used to predict the performance of stockpiled nuclear weapons), and a new form of cancer treatment called proton therapy. Even so, physicists still have a long way to go before they fully understand the ubiquitous proton. Scientists use telescopes to study stars and microscopes to study living cells. At Jefferson Lab, they use CEBAF (Continuous Electron Beam Accelerator Facility) and three experimental halls to study the stuff of stars, cells and everything in between. At its heart, all the matter in the universe that we can see is built of particles called quarks and gluons. These particles combine to form the familiar protons and neutrons found in the nucleus of the atom. Quarks come in six flavors: up, down, strange, charm, top and bottom. A fundamental force of nature, the strong force, binds quarks together so tightly that we can never find one alone. For instance, the proton is built of three quarks (one down and two up quarks) that constantly swap particles called gluons. 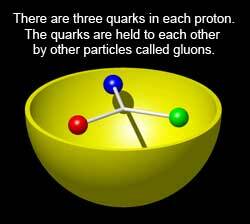 These gluons carry the strong force, so this swapping of gluons is what "glues" quarks together into protons, neutrons (one up and two down quarks), and other particles. Scientists are studying quarks, gluons, protons and neutrons inside the nucleus with CEBAF and its three experimental halls. Much like a giant, powerful microscope, CEBAF enables scientists to "see" things a million times smaller than an atom. This unprecedented view of the basic building blocks of ordinary matter and their interactions is allowing us to gain deeper insight into the particles and forces that build our universe.